On Sunday 10 June 2018, the annual terrorist supporting hate festival of Al Quds hit the streets of London. Quds Day (Quds being the Arabic name for Jerusalem), is the annual event usually held on the last Friday of Ramadan initiated in Iran in 1979 to support the Palestinians and oppose Israel. It soon spread to other Muslim countries but in recent years is also now held across many cities globally, including London. The day has always been inherently anti-Semitic but has also evolved as an opportunity to express hate of other rival states to Iran, primarily the United States and Saudi Arabia. The Ayatollah Khomeini of Iran declared the day for all Muslims to unite worldwide in solidarity against Israel and in support of Palestine and for the “liberation” of Jerusalem to be a religious duty of all Muslims. Participants in the day wave Palestinian flags but also chant “Death to Israel and America” and burn Israeli and American flags. Britain saw its first Quds Day rally in 2012. Over the years since, thousands have marched through central London ending up outside the US Embassy in Grosvenor Square. 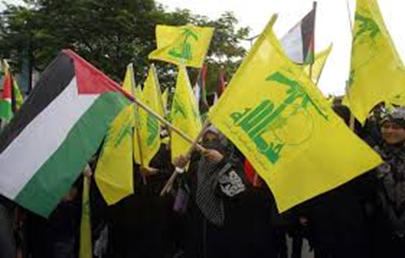 One concern of many regarding the marches is the presence of Hezbollah and their flags. Hezbollah, or the “Party of Allah”, is a Shia Islamist political party and militant group based in Lebanon, founded and funded by Iran. Despite Hezbollah themselves not distinguishing between their political and military activities, the UK government does, proscribing just the “military” wing but not the “political” wing. Many countries including Canada, France, Japan and the United States proscribe the entire organisation as a terrorist organisation. The one flag, with its emblazoned AK-47 assault rifle is shared across all elements of the organisation. In 2015, a one man protest opposed the London march. 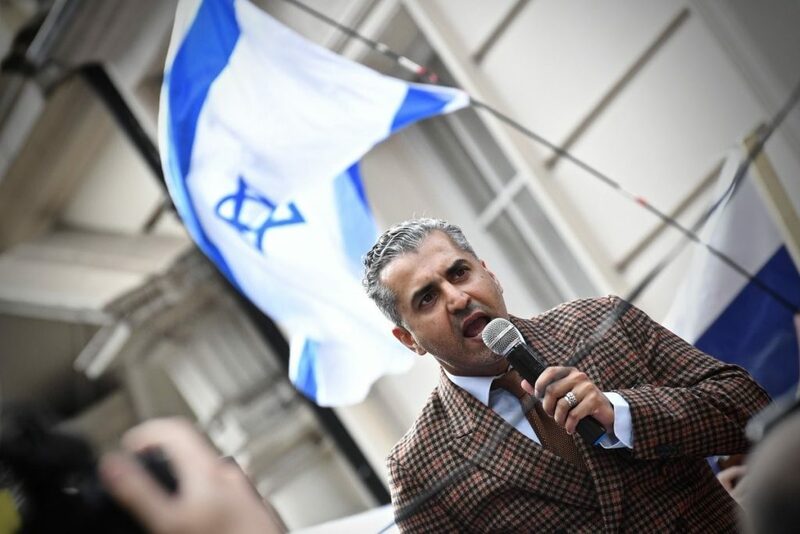 Joseph Cohen, the founder of the Israeli Advocacy Movement, is an Orthodox Jew originally from County Durham, who is a proud Zionist and has sought to reclaim the Israeli flag and actively advocate for Israel. 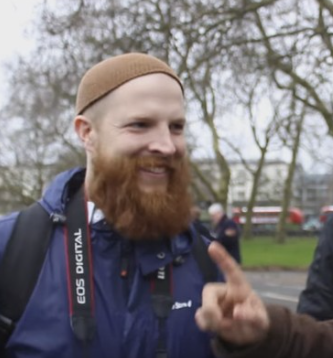 He regularly challenges the large numbers of Muslims who try to take over Speakers Corner in Hyde Park every Sunday. Each year, Cohen has increased the numbers in his counter protest. In 2017 he and his 100 or so group blocked the march in Oxford Street as it tried to reach its destination in Grosvenor Square. These calls however fell on deaf ears and once again the chilling sight occurred as the rifle-bearing flags of a terrorist organisation were openly paraded through the streets of a major capital city with impunity. With the American Embassy having relocated south of the river to Vauxhall, the Al Quds organisers could not be bothered to march south of the river, and announced that this year they would re-route, starting outside the Saudi Arabian Embassy and finishing in Whitehall. Another development this year, was that for the first time, calls for opposition protests were joined by a number of British Patriots and football groups. These called their supporters, many of whom were already in London for a separate demonstration the day before, to come and seek to halt the Al Quds march. There was much activity on-line and across social media highlighting concerns regarding the march, particularly following the numerous Islamic atrocities that have been committed in London and across the country over the last year and joining calls to ban and prevent the march from happening. Throughout the afternoon, the Police played cat and mouse up and down the alleyways and back roads of Mayfair with various groups of football lads and Patriots. I spoke to one who confirmed they had good turnouts from Chelsea, West Ham, Arsenal, Millwall and Portsmouth. One group of around 100 were kettled by the Police for around an hour not far from the Saudi Embassy. They were eventually released in small groups of two or three. The march was due to commence at 3:00pm, however, due to the large number of counter protesters, was not allowed to move off. Two and a half hours later at just gone 5:30pm, the Police finally allowed the march to commence. Around one thousand marchers were present by this time. In previous years there has been a significant number of Far Left supporters present in the march, with their Socialist Workers Party and Stop the War Coalition banners and placards. This year they were noticeable in their total absence. I wonder whether this was under the instruction of the newly polished, suited and booted Comrade Corbyn? In fact, Corbyn himself has previously attended and spoken at the march in 2012. As the march initially started to move it was immediately brought to a standstill by a group of Israel flag waving counter protesters. These danced to the accompaniment of a saxophone and trombone. As they danced happily, some Al Quds marchers confronted them aggressively and there was sudden potential for real violence. The Police quickly inserted a line between the two sides followed by a line of Police horses. The march finally proceeded off down to Piccadilly, right in to St James’s Street, along Pall Mall, past Trafalgar Square and down to Whitehall. Along the entire route they were preceded by a group of around 50 counter protesters, still playing music and singing. The two groups were separated by a line of Police horses and huge lines of riot Police and vans lined and followed the entire route. A few flashpoints occurred along the route as counter protesters managed to reach the main march. Even where one or two counter demonstrators stood on the roadside with Union flags as the march passed, these were greeted with looks of hate and anger on the Al Quds marchers faces, together with much shouting, swearing, rude hand gestures and beckoning people over for fights, this on a number of occasions from people marching side by side with children accompanying them in the march. Numerous children in the march were between the ages of five and eleven and were equally festooned in and carrying Palestinian and Hezbollah flags. I asked myself what evil hate their parents had filled their minds with? The Police did an effective job in preventing any violence on the day. As the march approached Whitehall its numbers had diminished, presumably as the long wait for its start and then winding route through central London had knocked some of its members’ stamina. With the ongoing and increasing threat of global Islamic terrorism and people’s genuine concerns regarding this, is it right and proper for an Islamic terrorist organisation to march through the streets of our capital, with flags festooned with AK-47s? Is it appropriate in this era of tightening Police budgets to police such an incendiary and hate filled event in this way? Some serious questions for the Government and Home Secretary.